The latest LoJack® Construction Equipment Theft Recovery Report has been released. You may access the PDF here and the infographic here. Heavy equipment theft cases have some similarities to vehicle theft, with both being crimes of opportunity or targeted by organized crime. The benefit for thieves is money from the resale or parts. 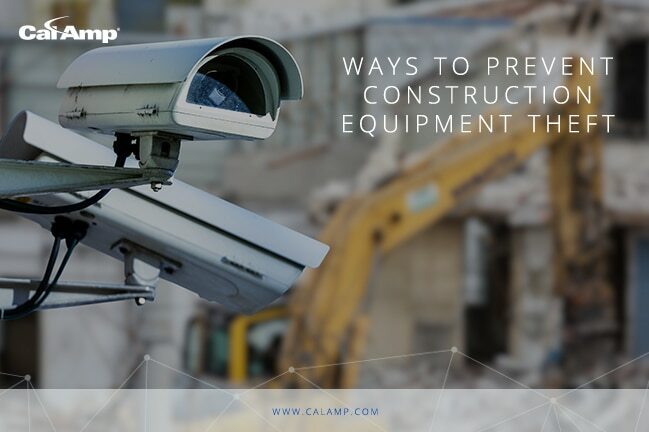 So how do you protect your construction equipment and vehicles? Most construction sites are defined by fences which can be locked in order to keep the general public out. If using a barrier isn’t an option, try to group the equipment together and even consider chaining them as it makes them more difficult to move and could decrease the desirability as a target. A popular practice is having visible video cameras and motion lighting for determent. Another method that thieves may use is assuming the identity of a crew member or transport driver. Unless you recognize someone, it is best to review credentials and check with the hired company when a person is asking to remove equipment. This should be part of your documented check-in and –out system. Also, check the day’s schedule if a request seems unexpected. Implementing mixed fleet telematics, such as AssetOutlook™, provides early warning of possible unauthorized use and theft. There are alerts triggered by ignition on and movement during off-work hours. If you establish geozones or virtual boundaries, you can be notified when an asset enters or leaves the area. Using AssetOutlook’s Esri mapping tool, you are able to pinpoint equipment individually, by type and by location. The breadcrumb option allows you to view the route taken. By adding the LoJack® Asset Recovery System businesses can help further protect their equipment from loss due to theft. With hundreds of millions of dollars of recovered assets to date, as cited in LoJack’s 2016 Construction Equipment Theft Recovery Report, the LoJack® System is a smart added layer of security for any contractor or equipment rental firm. In our next post on this topic, we will share some equipment theft stories that demonstrate the value of theft prevention using technology. These common sense practices plus the use of technology will improve the protection of your equipment from theft. Download the 2016 LoJack® Construction Equipment Theft Recovery Report here and the infographic here.